These satellites first started looking at Earth-Sun interactions when green text on black backgrounds was stylish (with cutting-edge blink tags!) and pagers were a key part of pop culture, yet they're still bringing us new science today. That's just impressive! Assembled in the '90s, the Global Geospace Science (GGS) flotilla of satellites consisted of Wind, Polar, Equator-S, and Geotail. Wind took the lead in an elliptical orbit around Lagrange point L1, a point 1.5 million kilometers from the Earth where the pull of gravity from the Earth and sun balance to create a stable spot in space. The Polar and Equator-S were thoroughly uncreatively named satellites, settling exactly where the name suggested, either in polar orbit to observe the Earth's magnetosphere from high latitudes or in equatorial orbit to take equatorial magnetosphere measurements. Geotail took the rearguard to measure the elongated magnetotail trailing behind the Earth away from the sun. The campaign quickly escalated, extending with the addition of the Solar and Heliospheric Observatory (SOHO) and Cluster to form the International Solar Terrestrial Program (ISTP). Wind continued to act as scout and sentry, the farthest sunward spacecraft and the first to detect solar wind events, while Polar and Geotail maintained their pre-established positions. While SOHO kept its telescopic eye firmly pointed at the sun, Cluster embraced a different concept. Instead of a single spacecraft, it's a tiny constellation of four identical satellites flying in a lopsided pyramid formation. The satellites take simultaneous measurements in an effort to differentiate between spatial and temporal variation in the magnetic field and solar wind. The advantage of the ISTP was in keeping the spacecraft within 145,000 kilometers of a neighbour, close enough that that measurements at one satellite could be correlated with measurements from other satellites. Any farther apart, and pattern shifted too much to be clearly identified as part of the same phenomena. Some of the spacecraft fared better than others: Wind, and Geotail continue operations today well beyond their design lifetimes and Polar lasted over a decade, but Equator-S didn't make it even a single year. Here's the story of the satellites, ending with my latest candidate for you to develop a crush on a large, inanimate, heavy piece of advanced technology surviving the harshness of space. The idea of placing a satellite in equatorial orbit to monitor the Earth's magnetic field as it bent and flexed under the solar wind was a popular but often-delayed idea. After original plans for an equatorial satellite were scrapped not once but twice decades apart, a low-cost version was developed to take advantage of scraped together funds by the German Space Agency. Equator-S was unique for both its equatorial orbit and high spin rate. Unfortunately, that's about all there is to say about it: designed to last two years, the satellite launched in December 1997 but went silent just a few months later in May 1998. The poles are home to the most colourful interactions between the solar wind and the Earth's magnetic field, where the charged particles excite visual responses in nebulous aurora. To keep an eye on the excitement, Polar was launched in 1996 and set on a polar orbit to collect low-, mid-, and high-altitude data over these delightfully active regions. Three of twelve instruments directly monitored aurora in optical, ultra-violet, and X-ray light every time the satellite passed through its apogee over the north pole. The other nine instruments continuously measured particle flux and field strength throughout the entire orbit. Polar finally ceased operations after over a decade of service in 2008. At the opposite side of the planet measuring was Geotail, a spin-stabilized satellite relying on a two-hour battery to power it during the frequent dips into darkness. Geotail originally hung way back, keeping its apogee in the Earth's shadow. Maintaining position on the night side required an intricate dance of double lunar swing-by manoeuvring with an orbital period of one to four months. For most of the first two years, it was far back in the distant magnetotail at 1.3 million kilometers from the Earth, but in 1995 its orbit was tightened to bring it into the near-Earth magnetotail at barely 200,000 kilometers from the planet. But I've saved the first spacecraft for last: Wind is the vanguard of explorers, out in front of our planet surfing the point where solar wind meets sail, but it's also tough, shielded, with redundant backups to safeguard against failure, and enough fuel to keep it flying for decades to come. If you admire the rugged grittiness of Battlestar Galactica, Wind deserves a place in your survivalist heart. The freakiest part of all is that in one key way, it still carries instruments that put modern satellites to shame. Launched in 1994 and using magnetic tapes to record data, this spacecraft has not only survived nearly two full solar cycles and countless flares, but is still holder of the record for more measurements of the solar wind per second than any other near-Earth satellite, and doing it every second of every day. Every second, it takes 11 magnetic measurements; every three seconds, it takes a particle observation. While still fast by today's standards, this is just barely quick enough to detect subtle magnetic reconnection events in thin streams of accelerating particles, reconnection jets. A dayside mirror to Geotail, Wind required intricate loops with a double lunar flyby to maintain this position in constant sunlight. The satellite started its observations in the L1 Lagrange point, the leading location where the pull of the Earth and Sun's gravity balances out to create a lazy patch of space for low-energy orbits. It was the first satellite to take up residence long-term in this location, and had the spot to itself for years until the Advanced Composition Explorer (ACE) spacecraft snuggled next to Wind in 1997. The new satellite was tasked with not just measuring the solar wind, but also trying to catch warning of coronal mass ejections. Instead of taking the same measurements in the same place with both spacecraft, the project scientists shifted Wind over to the second Lagrange point (L2), 1.75 million kilometers down the magnetotail. 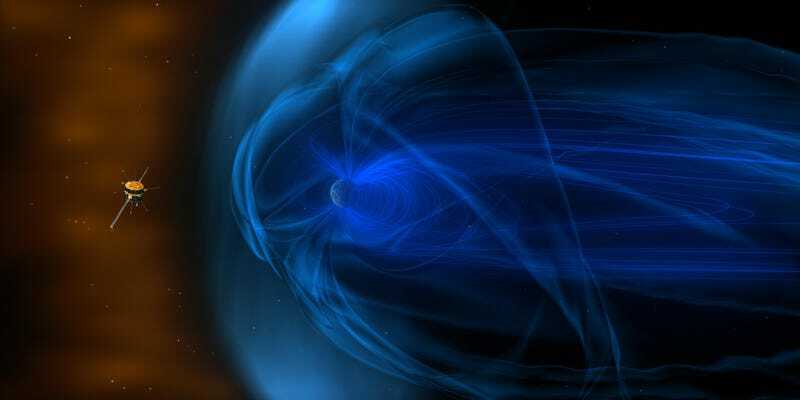 In 2000, the Wind spacecraft shuffled around to the side of the magnetosphere 2.4 million kilometers from the Earth and through a series of petal-orbits through the ecliptic, back to the magnetotail, and finally returned permanently to the L1 point in 2003. What has it learned in all this orbital dancing? Everything from accidental discoveries that magnetars are a real thing to oh-so-much about our sun and its winds full of particles. From the Wind satellite, we learned that the solar wind blows hot and cold, and how the magnetic field of our Earth flickers under its power. With each new observation — the solar wind leaves the sun, the journey through the corona speeds and heats it even further — leads to new mysteries to unravel. Wind was built for a five-year mission, but has enough fuel to keep it orbiting in its current location until 2074, doing science just as long as its instruments (and funding for its ground-based scientists) hold out. This is good news, as the hardworking satellite has a new mission starting in 2018 with the launch of Solar Probe Plus. The Solar Probe+ will snuggle closer to the sun than spacecraft has before, getting to within 6.1 million kilometers of the scorching surface to visit our home star. And Wind will be watching, providing a contextual viewpoint on what's happening from a safe distance as the probe sneaks in so close to the sun. These satellites fascinate me. Our robotic explorers lasting far beyond their designed scientific lifespans, continuing to produce new observations and discoveries about our solar system. The technology is unmistakably old and we could do better, yet they're perfectly serviceable in pushing the edge of what we understand. Thank you, not-so-little robotic representatives. You're doing good science. Learn more about satellites focused on understanding how our sun impacts the rest of our solar system at the Heliophysics Systems Observatory research page. 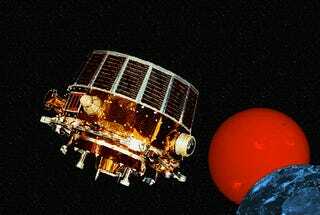 Love hearing about these heliophysics spacecraft that never die? The International Sun-Earth Explorer's third satellite (ISEE-3) made news in 2014 when it became the first crowd-funded, crowdsourced, open-access reclaimed satellite.